Leptin is at the top of the hormonal hierarchy. Leptin & weight loss are very, very closely linked. Leptin might as well lumped in with insulin (in terms of its paramount importance) because, like insulin, its influence on fat loss is overwhelming. Here’s the thing about leptin: it’s JOB is to keep you from storing too much fat. Unfortunately, when it’s signaling ability gets screwed up, it can make it very difficult for you to release and burn fat. Leptin is released by our fat cells. Consider it the “hall monitor” of fat accumulation. When you start accumulating excess body fat in your adipose tissue, your fat cells release leptin to signal the brain that plenty of fuel is available. This signal then kicks off a cascade of events to decrease your hunger and increase your metabolism (by stimulating your thyroid and adrenals). On the flip side, when there aren’t an excess of fat cells secreting leptin, the low leptin levels communicate to the brain that there isn’t enough energy stored and so your appetite is stimulated and your metabolic rate is slowed down to help conserve energy. Sounds like a pretty perfect system that should keep anyone from gaining too much weight, right? Unfortunately, just like what happens with insulin, we fuel our bodies so poorly that leptin’s ability to signal goes very wrong. 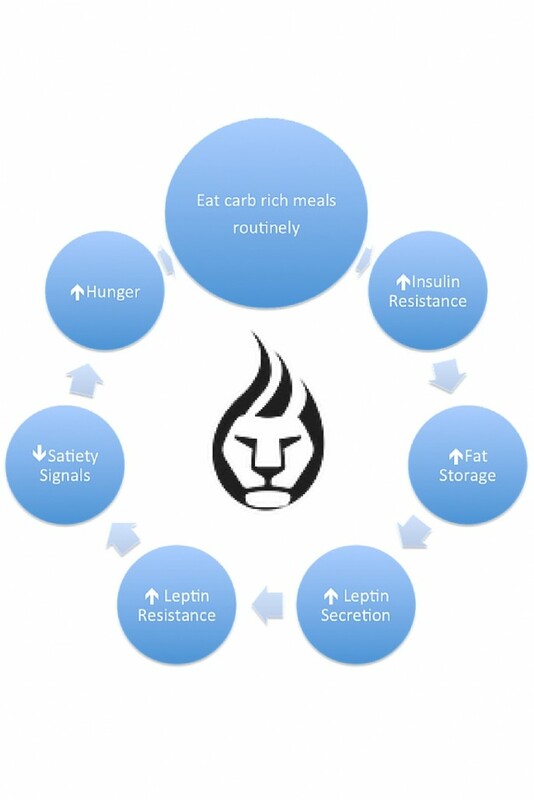 Just like we have the carbohydrate cycle, there is a similar cycle I’ve put together to show how chronically high carbohydrate diets and high insulin levels impair the proper function of leptin in a big way. Let’s look at what happens here – and remember – this is what happens over time, leading to excess weight gain, insulin resistance and ultimately leptin resistance, making it hard for overweight and obese people to break the cycle and successfully lose weight. So you’ll recall that when we routinely eat high carbohydrate diets, especially processed, cheap carbohydrates that send our blood sugar through the roof, our body becomes far less sensitive to the presence of insulin (check out this insulin overview I posted a couple months ago). This is what we call insulin resistance and it causes our body to store more fat. More fat means that more leptin is going to be released (because leptin is released by our fat cells). Well, as you continuously pile on more fat cells, leptin secretion continues to rise. The same thing happens that we saw with insulin. Leptin is always around and your body tunes out the signals it is sending out. Leptin resistance and insulin resistance go hand in hand. When you are leptin resistant to any degree, your body won’t receive the satiety signals it is supposed to. You can eat in excess without feeling full. Your hunger mechanisms are rarely turned off. Your metabolic rate slows because you aren’t receiving the messages that ample fuel is available (in your fat stores) so your adrenal and thyroid function slows. So you eat more, you are highly likely to store the food you do eat as excess body fat, and you rarely feel satisfied. There is good news though. As with insulin, we have a tremendous amount of control over the action of leptin through the food we eat and the lifestyle habits we adopt. Because leptin is so significantly impacted by insulin, one of the most important things you can do to encourage healthy leptin signaling is to control blood sugar. How do we do that? When you are ready, incorporate high intensity interval workouts 2-3 times each week. These metabolic hormones are all closely intertwined. We’ve talked about how insulin and leptin go hand in hand but you also see that leptin function influences your thyroid hormones and your adrenals. You cannot address one without impacting the other. If you do damage to one, it will impair the others. Remember that while calories do matter, you can’t make lasting progress without working towards balancing these critical metabolic hormones. I really didn’t know any of this stuff, you spelled it out really simply! Very interesting. Fortunately I eat a pretty strict Paleo diet anyway, so I’m keeping everything in working order without knowing about it. Still – one more reason to stay Paleo! Absolutely!!! Tons of great reasons to stay Paleo! I’m really glad you learned something! Thanks for writing – I love the feedback!